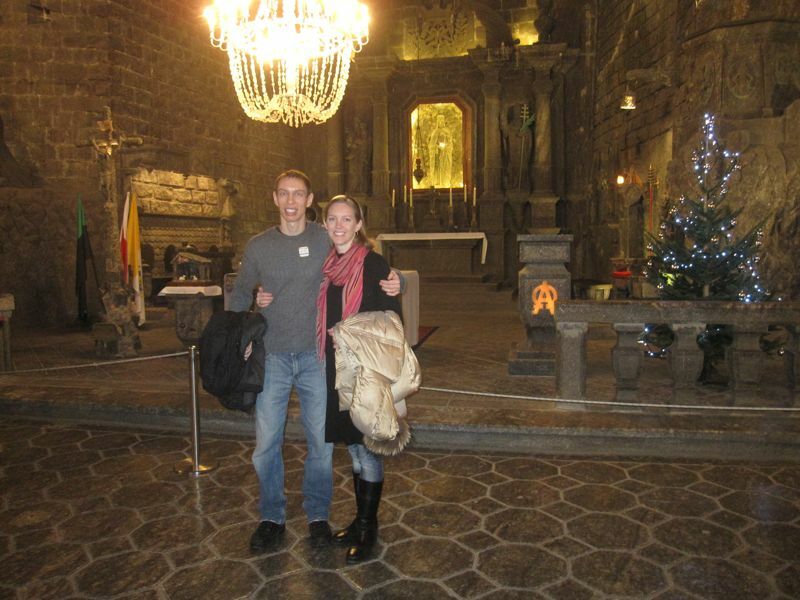 Posing in the enormous chapel built into Poland's Wieliczka Salt Mine. So, here we are – sitting in the airport at 2am after arriving back in Ukraine. Our flight arrived at midnight, our bus leaves until 8am, and we didn’t want to pay for a hostel for just a few hours of sleep. It is entirely possible that the next time we come to Kyiv’s airport will be when we are leaving Ukraine for good, which is strange to think about. Our Christmas/New Year trip turned out really well, and we got to see some amazing sights. 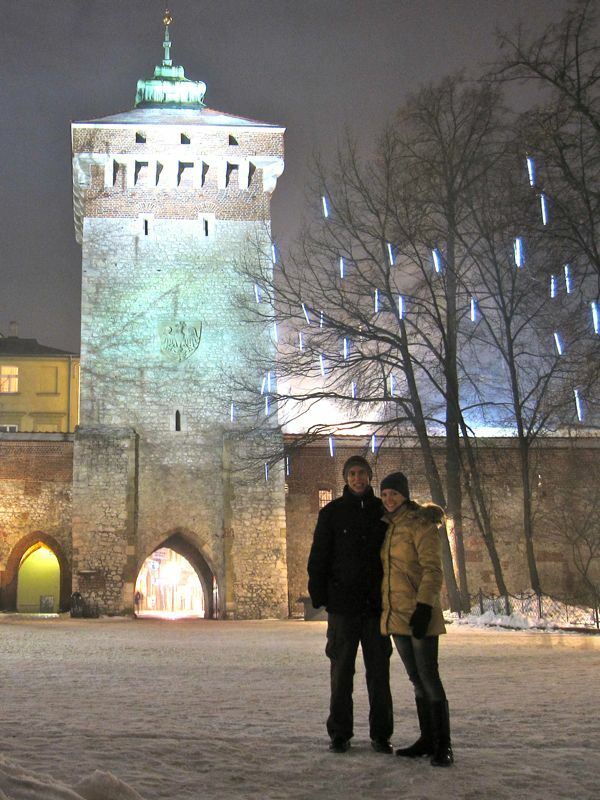 First, we spent a week in Krakow, including Christmas, and stayed at a popular hostel—Greg & Tom—where we met lots of interesting travelers. While there, we visited a number of museums, went on an informative walking tour of the city, and got our fill of medieval and WWII history. Apparently, Krakow had its heyday in the 15th Century, when the market town was booming with traders traveling between Europe, Asia, and the Middle East. We toured a fraction of a huge salt mine that was begun 900 years ago. Up until recently, people have been pulling huge chunks of salt out of the earth, some 99% pure, and leaving behind amazing tunnels and caverns. Miners turned some of these spaces into chapels, and even carved amazing figurines out of the walls and floors. The infamous gate and train tracks into the Birkenau camp. Of course, Krakow is also known for being a center of Nazi occupation during WWII and infamous for the many nearby concentration/death camps. 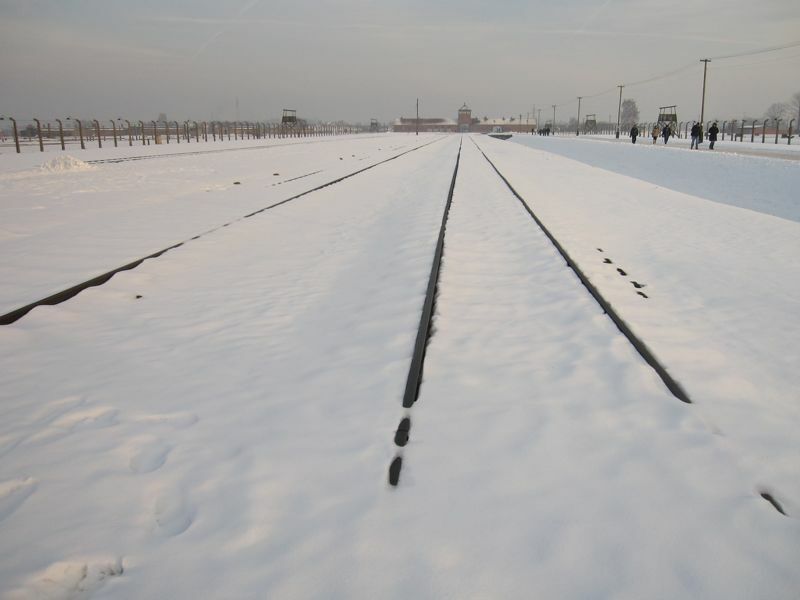 We spent a day touring Auschwitz I and Auschwitz II – Birkenau, where millions of Jews and others were killed. I feel like the experience should have left me feeling grief-stricken and haunted, but the truth is that it was simply impossible for me to fully wrap my head around the atrocities that happened there. Although I have taken university classes, watched films, and read survivors’ memoirs, I still can’t really comprehend the actual suffering and despair that so many people encountered there. I would like to read, or re-read, some accounts by camp survivors, since that may help me better understand the places that we saw. Pretty decent view from our hostel in Zdiar! Our original plan was to go back to Ukraine and hang out in the cool city of Lviv to ring in the New Year. However, when we found out that individual dorm beds were going for $30 a night (an increase of 150%), we decided to look for other options. 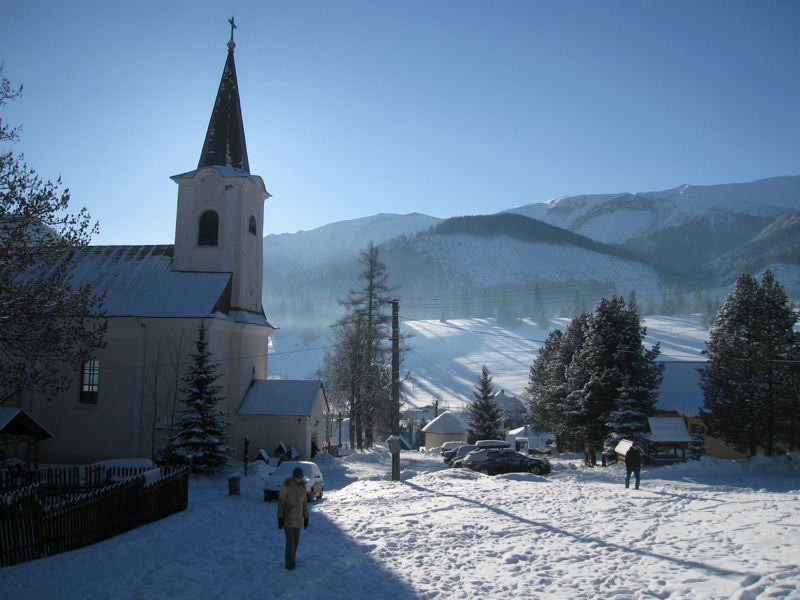 Alex couldn’t help but notice a brochure for a hostel called the “Ginger Monkey,” so we traveled a few hours from Krakow into Slovakia’s beautiful Tatra mountains. One day, we took a three-hour hike in the snow up to a valley amongst the rocky peaks, where had lunch at a little “chateau.” Our second day, we went on a long snowy walk with the hostel’s dog Wally. Although we threw countless sticks and snowballs, he was still full of energy at the end of the day, and we started thinking of how much fun it will be to have a pup of our own when we return to the States. 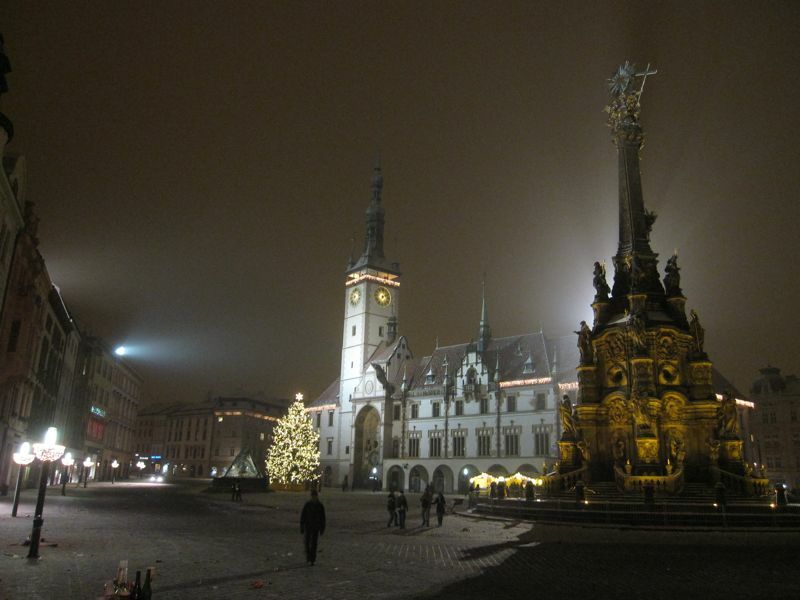 Olomouc's main square slowly cleared out as revelers went home in the early hours of 2011. While looking online, we managed to find a hostel with cheap beds available for New Years. Poets’ Corner is a very comfortable place run by friendly Australians in the small Czech city of Olomouc. We enjoyed wandering the town’s cobblestone streets and checking out the old city walls. Olomouc is located in the heart of Moravia, so we ate lots of good food, particularly enjoying the garlic soup. For New Years, we joined a small crowd on the main square, where a Queen cover band opened for an AC/DC cover band, all performing in front of a large poster of a Moravian manger scene. The Baby Jesus would have appreciated a little 80s rock, right?! At midnight, the town set off a huge display of fireworks behind the city hall, while almost every small Czech group had their own fireworks to set off. Fireworks going off on all sides can be a little unsettling, but it was fun to watch. A DJ got some music going, and we danced on the square for a couple more hours. 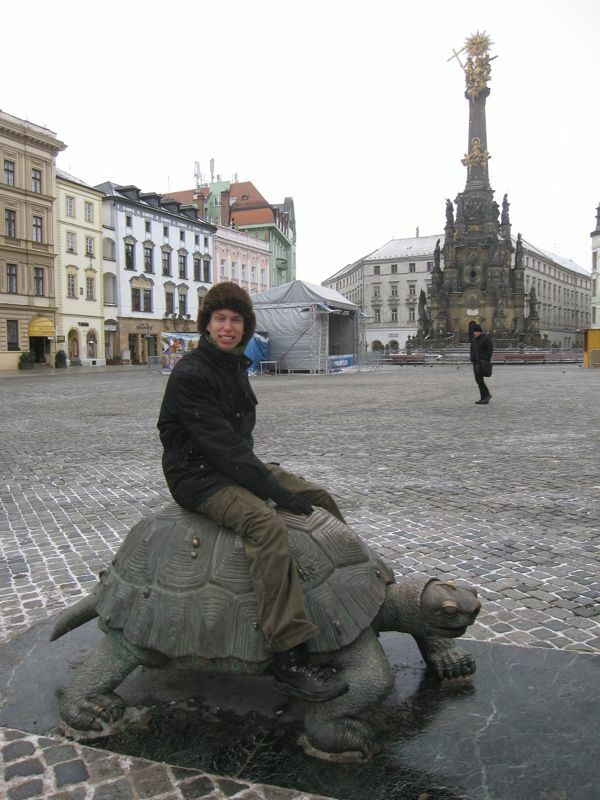 Alex begins the slow journey back to Ukraine from Olomouc. After two weeks of traveling, we’re ready to head home and relax in our comfortable little apartment. 2011 is sure to be an exciting year: we hope to finish our Peace Corps service in the summer, spend a couple months traveling around Southeast Asia, and then settle into grad school and/or work by the end of the year. Whatever the future holds, we’re thankful for our supportive family and friends, and we feel extraordinarily lucky to have the opportunity for so many unique adventures and experiences. Happy New Year to you all! Check out more photos from our trip! I really like the PC website, Alex. Susan and I recall you working on it during our visit with you. Wow, it’s hard to believe you will be leaving Ukraine for Thailand in four months. I know you will be busy completing your project. We’re well. I spend a couple days with the Senior Men’s Bible Class this week. Love, Papa G.
Uhmmm, so it’s March 11 and I’m just a little late; but having finally sat down, read your blog and looked at ALL your Christmas trip photos, I must say a HUGE THANK YOU for sharing your wonderful trip with us. You do such a superb job of letting us in on your various adventures, and the photos from Slovakia especially bring back so many grand memories of our time in the Czech Republic last summer. Next Next post: Playgrounds in progress!